Our new series for making good style painless. Free Prime shipping and free returns if you don’t like it or it doesn’t fit. This look specifically was inspired by a photo we included in our Huge Fall Style Inspiration Album by Instagram user The Pacman82. It was one of my favorites in the album and has ended up being one of the most saved on Pinterest by all you guys. His outfit is a little more casual because of the medium wash denim, lighter belt and boots, and heavy, textured tie. His is also comprised of more higher priced “upgrade” brands like Bonobos, Grayers, Alden, Uniform Wares, and Ralph Lauren. This is my take that will have you looking shaaaaaarp and still let you pay rent on time. Two things to note: The shirt is Regular Fit, so if you're a slimmer guy make sure you size down or find a similar option in a slim fit. This pattern is known as tattersall and it's easy to dress up or down. Also, the jacket has elbow patches, just an FYI in case that's not your thing. I'm normally a 38, and I ordered both the 38 Regular and the 38 Short. This is the Short and it fits perfectly out of the box, I didn't have any alterations done to it. It falls mid seat, which is just right for a blazer that you want to wear with jeans. These are my boots by Thursday Boot Company. 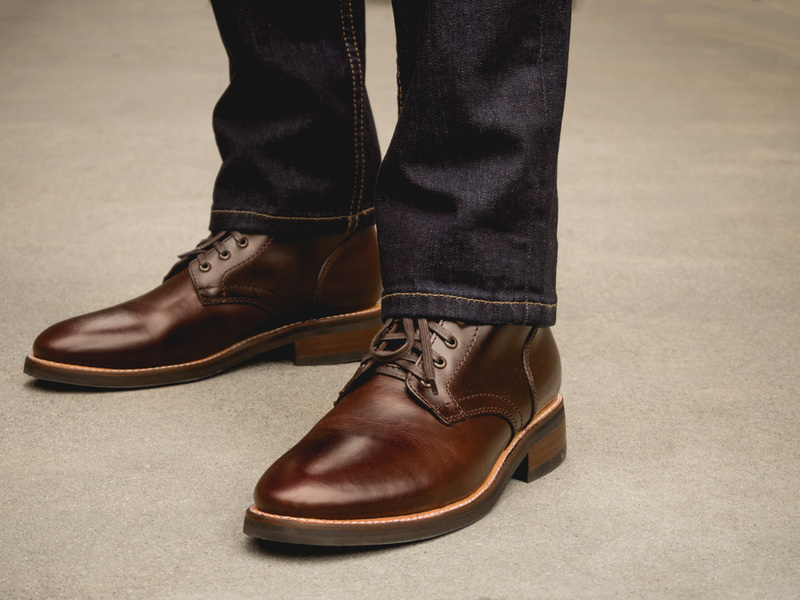 They're an awesome, more affordable alternative ($199) to more expensive options like the Wolverine 1000 Mile Boot ($350). I've featured my suede boots from them before and have been happy with how they've held up. 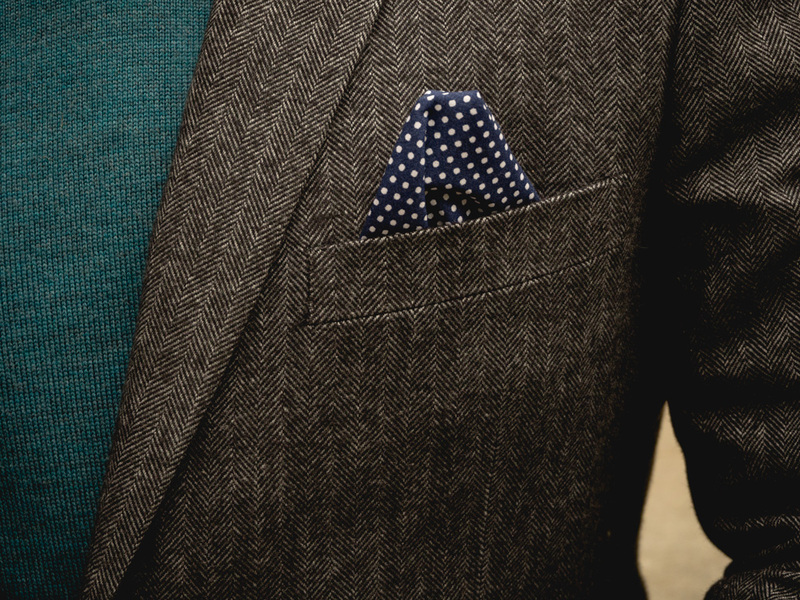 A good pro-tip is to rarely match your pocket square with your tie. When you're starting out it seems like that would be a good thing to do like not wearing a brown belt with black shoes, but it ends up being jarring in its own way. 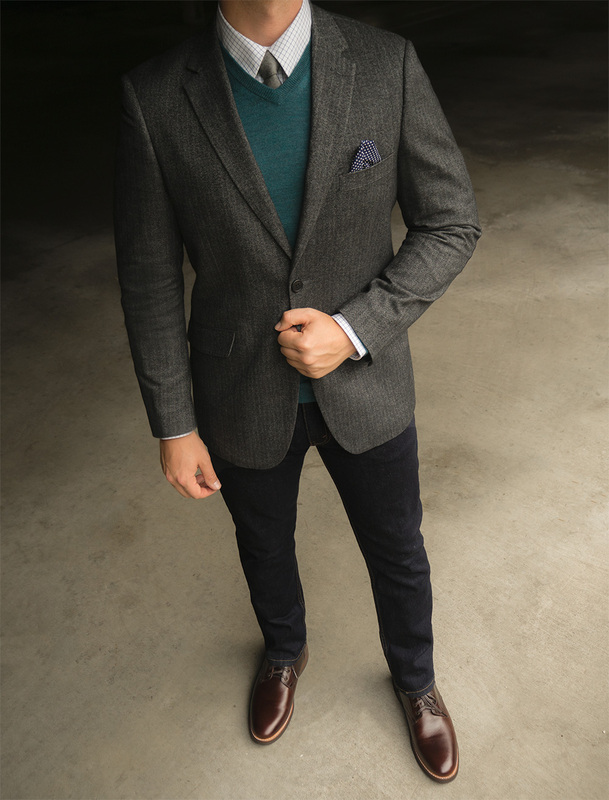 Here, the sweater provides the color, the chambray tie is subdued and has texture, and the polka dot pocket square adds contrasting texture to the herringbone blazer and tattersall shirt. If you analyze the photo below, there's actually A LOT going on, but it works because the different colors, patterns, and textures complement each other. What do you guys think?! Chat with me in the comments! And please share this if you think it will help some guys. Are the levis’s the dark hollow color/make? I’ve been looking for a good pair of dark 511s since I no longer fit into the rigid dragons (previous favorite). I’ve found Levi’a to be really inconsistent with their colours. For example in the U.K the darkest indigo we have is called rock cord. So I normally just try find the darkest denim they have, and go from there. Levi’s is inconsistent on everything, sizing, color, etc. If you can tolerate this, I would recommend getting several versions of the exact same thing and then sending back all but the least screwed up ones. This applies to Levi.com too, not the cheaper outlet jeans etc. ZERO quality control. I’ve had the same experience with $200 pairs of jeans – in fact, those companies try to tout not having two pairs that are exactly alike as some sort of “craftsman” badge of honor. In the end, Levi’s variety of choices and mass availability still make it the best, IMHO. It is in the nature of denim to be less consistent than other fabrics. I abide by the “rule of 3” – I always grab 3 of the same pair to try on, and 1 will usually be just right. That’s a good point, I’ll give them a go. I have a Levi’s store by me so I’ll see what they have when I’m Next around there. Yep! The dark hollow color. I’ve never tried an entire look from Amazing before. I usually just go there for the odd henley. But I’ll give something like this a go, especially now I know the fit of 511’s. 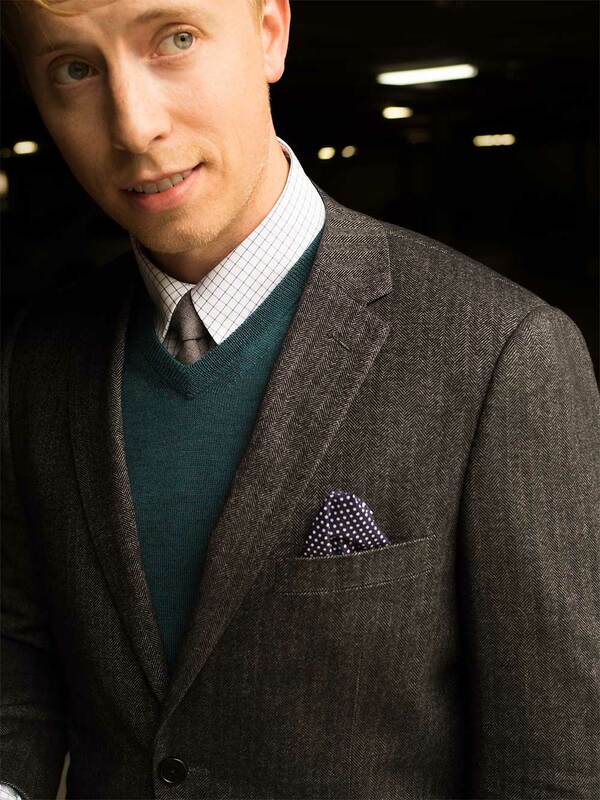 I really like how the tie and pocket square compliment each other really well. What I really like about the getups, is as I aaauire more clothes I can tick certain things off my list. For example I’ve got plenty of v neck jumpers and dark denim. All I really need to replicate this look is the blazer and some dress boots. It’s a really good gauge of how my style is progresssing without taking up my entire wardrobe. That’s really true. At the moment I have a lot of stuff that’s out of season. But with it being fall now I’m starting to find out what I’m liking in my closet and wearing more of. That’s true a simple and organised closet is the best. Well done, Andrew. Well done. This is my favorite outfit that you’ve done so far. Looks great! I noticed that the original getup has a really fitted sweater, but I’ve never been able to find one like that. Do you know where fitted sweaters are sold? Also, my wife sees me getting great ideas from your Primer getups all the time and she wants to know if there’s an equivalent for women. Do you know if a Primer/Getup like online mag exists? Thanks for curating this Amazon outfit! Hey James! I’d say this one is pretty fitted, have you tried sizing down? I do that a lot with sweaters. Unfortunately I don’t know of any women style sites but I know there are a lot of bloggers and instagrammers so there must be something out there. Love the Amazon Prime twist, certainly makes it easier. Keep up the great work! How heavy is the blazer fabric and lining? Yes – how heavy is this jacket? I’m the opposite, I live in Chicago so this could be perfect or way too lightweight. I noticed on Amazon it is 100% cotton. I’d say this jacket is a medium weight compared to others I have. Should do well to keep you warm with the right layers. Great look! For those looking for an alternative of the Levi’s, DSTLD jeans have great prices and amazing fits. Love the idea for this series! I’ve been searching for a well-fitting fall blazer so I ordered these and added to my tryout list. Wish-listing those jeans and boots too! Been eyeing Thursday boots for a while and you pushed me over the edge with this outfit! Definitely my style. Andrew, thank you for the recommendation, I picked up the jacket. I typically fall into the “sizing” category as Brock over at TMM and the jacket was almost a perfect fit for me. Much appreciated. Got this blazer and was surprisingly impressed by the cotton herringbone fabric; nice weight and soft to the touch. My only issue is with the arms; did the sleeves seem baggy to you? possible snd worth pursuing. . Interesting! Mine were slim, maybe that had to do with getting the Short size. Slimming arms is not a major job usually. Beautiful colors Andrew. You really out done yourself. I can really see myself wearing this. Particularity the shoe is more attractive is from all of that. love the cloths but when I noticed total price then skip it. I’m not a small guy, how would I keep this from looking bulky?